GestureTek's durable, low-maintenance gesture control display technology has become a standard in this market, offering limitless potential for infotainment and edutainment. Our highly-engaging touch free exhibits allow museums and science centers to creatively showcase priceless artifacts, present complex concepts and principles and communicate naturally-occurring phenomena, with minimum risk and maximum visitor impact. The technology also works well for guide maps and way-finding systems. For a portable, turnkey, plug and play interactive display solution for entertainment and eductainment, check out our Cube floor projection system. Mexico's Chihuahua Museum Uses Cube Portable Interactive Floors and Illuminate Multi-Touch Tables to Educate and Entertain Kids. GestureTek’s Cube system has become the latest addition to an interactive gallery within Discovery Science Place called “Discovery Zone”. Multi-Touch Tables Educate and Entertain Children at the National Museum of Natural History in Paris, France. Leading High-tech Manufacturer And Branding Agency Use Gesturetek WallFX Technology To Create A Show Stopping Interactive Wall Display. Science North Blends Education And Entertainment With Immersive Interactive Quiz Game. Calgary Creates World of Interactive ‘Edutainment’ with GestureTek’s Motion-Controlled Display Systems. Visitors could go on a virtual archaeological dig. Design the perfect livingroom...in Virtual Reality! 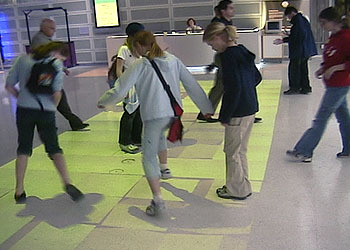 GroundFX® – Interactive Edutainment Displays.